First Nation people have faced a difficult journey throughout North America. Many families have been adversely affected by years of colonization. The responsibility to correct this situation is upon all Canadian people, however, it is the Child welfare system that is expected to fix this on behalf of Canadian society. Many recommendations were made regarding the justice system and the Child Welfare system. 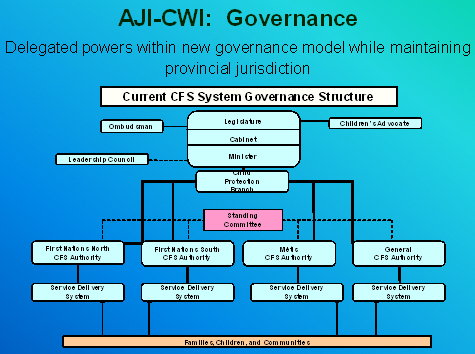 The Aboriginal Justice Inquiry-Child Welfare Initiative (AJI-CWI) was a joint initiative of the Manitoba Métis Federation, Assembly of Manitoba Chiefs, Manitoba Keewatinow Okimakanak and the Province of Manitoba to restructure the Child and Family Services system in Manitoba. A new approach to governing the delivery of Child and Family Services in Manitoba was established.